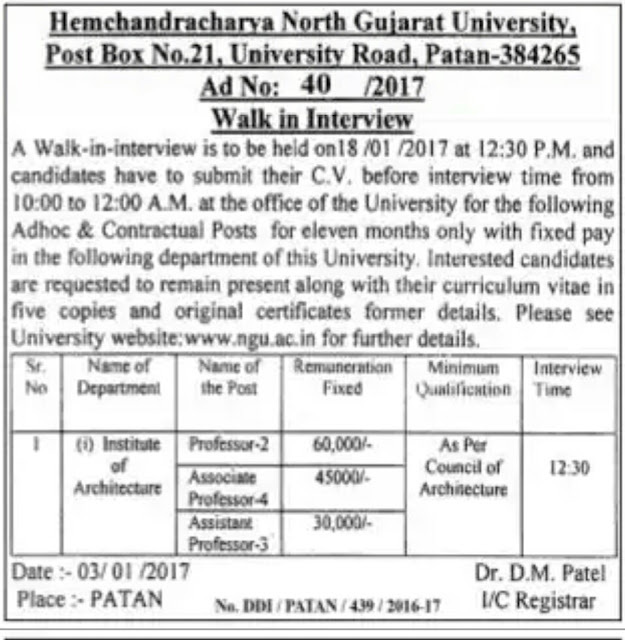 HNGU Walk in Interview 2017: A walk in interview is to be held on 18 January, 2017 at 12:30 P.M. and Candidates have to submit their C.V. before interview time from 10:00 to 12:00 A.M. at the office of the University for the following Adhoc & Contractual Post for eleven months only with fixed pay in the following department of this University. Interested candidates are requested to remain present along with their C.V in five copies and original certificates former details. Please see University website:www.ngu.ac.in for further details.